About 40 police officers have been dispatched in response to the shooting, head of Marseilles police, Pierre-Marie Bourniquel, told the media. "There has been shooting from people wearing masks and armed with Kalashnikovs in the direction of a police vehicle," said Bourniquel. 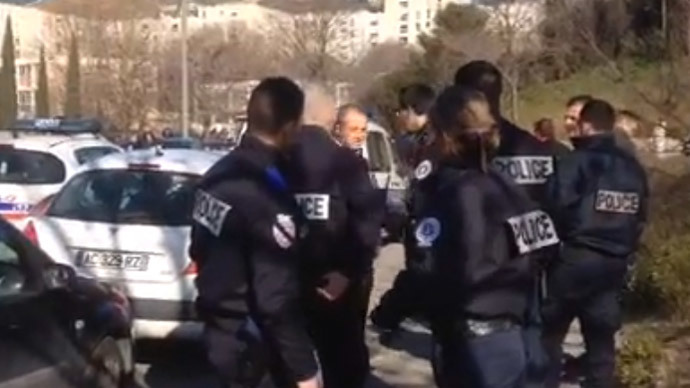 Bourniquel was among the police officers at the scene during the shooting, Le Figaro said. Police have blocked a housing estate in search of the gunmen, Reuters reports. The residents of the neighborhood were ordered to stay indoors. The district has some 7,000 inhabitants. But the newspaper said the shooting was not another terrorist attack, but was related to drug gang wars. The shooting happened in the La Castellane district of the city, the newspaper said. "It's [the district] got everything - prostitution, drugs trafficking, violence. It's a dangerous cocktail and we saw evidence of that today," local senator Samia Ghali told BFMTV. AFP said the Kalashnikov AK-47 rifles were shot “in the air.” No casualties were reported. According to French media, Valls was not in the city at the moment of the attack. His arrival is expected later in the afternoon. Security in France remains a hot issue in the wake of Islamist attacks last month, when gunmen massacred journalists from the satirical weekly magazine Charlie Hebdo and took hostages at a kosher supermarket.